When Picasso visited Horta de Ebro in the summer of 1909, it was his second visit to the village on the Aragon border, having earlier spent seven months there in 1898 with his friend Manuel Pallares. Horto, like Gosol was a quiet mountain village and here Picasso began a series of landscape views. These followed on from the paintings he had produced a gear earlier at La Rue-des-Bois, as well as Braque's views of L'Estaque, One of the best known of these works, Foctory at Horto de Ebro, again draws heavily from Cezanne both in colour and form. One of the most notable features, however, is the way in which Picasso has happily manipulated the topographical features of the landscape. The chimney that appears in the background is, in fact, nowhere evident in Horta. 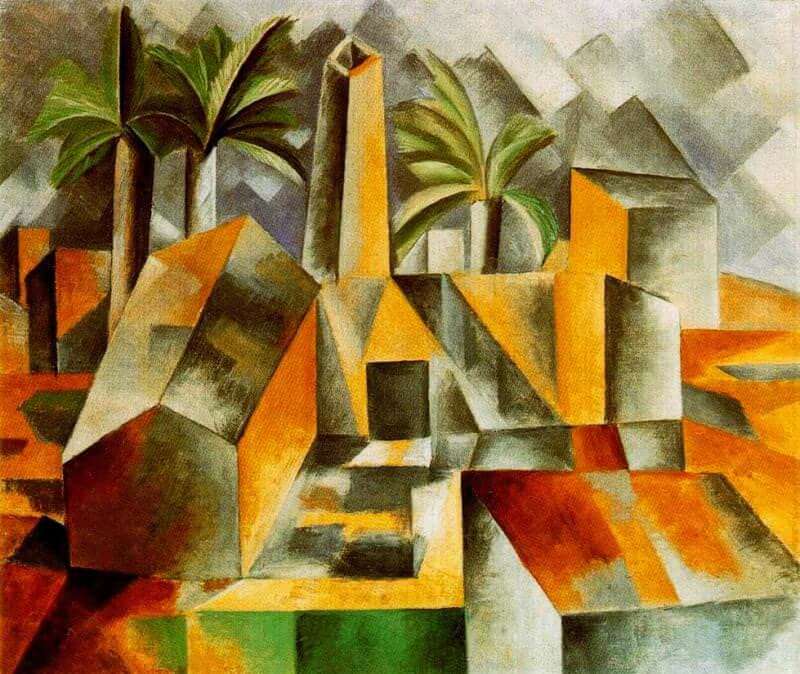 Rather it represents a chimney used for burning olive waste, situated away from the village, Similarly, Picasso has included palm trees in this work, though no such trees grew in or near the village. Picasso has freely introduced these motives to serve the compositional structure of the work.